How do I add an event to my calendar as an instructor? You can add a personal reminder to your own Calendar for an upcoming event. In Global Navigation, click the Calendar link. Click any date on the calendar to add an event . Or, click the arrows next to the month name to navigate to a different month  and select a date. If you don't want to manually locate the date, you can click the Add icon . Enter a title for the event . Depending on how you added your event, the date may be populated for you. If not, enter a date in the date field . The calendar times may also be populated for you in the From fields . Edit or enter the start and end time for your event. To create an all-day event, leave the From fields blank so there is no start and end time for your event. If a location is required, enter a location for the event . To add additional details to your event, click the More Options button . 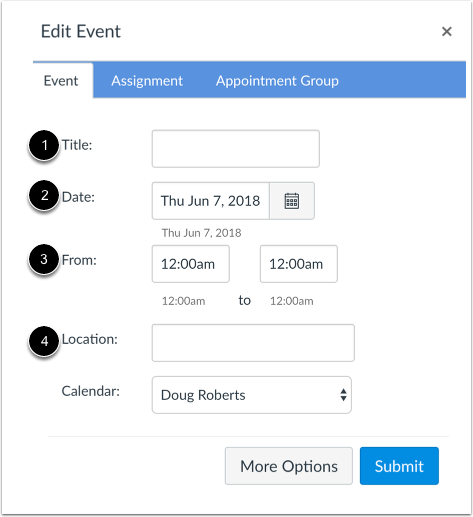 You can use the Rich Content Editor to add a description or resource links, add an address location, and duplicate the event. Otherwise, click the Submit button . Previous Topic:How do I add and duplicate an event in the Calendar as an instructor? Next Topic:How do I add an assignment from the Calendar? Table of Contents > Calendar > How do I add an event to my calendar as an instructor? Re: Is there a calendar on Canvas?